Can’t sleep tonight. My mind is all over the place trying to make sense of some tragic news and other situations that, while not as tragic as the murder and suicide attempt, are still tough to watch as a friend. Has me thinking about the fragility of mental health. On one hand, I am watching a friend I love experience what I can only describe as full-blown hypochondria. I have never witnessed this in my life. Sure, I’ve joked about it and haphazardly labeled a person or two “hypochondriacs” for suddenly acquiring life-threatening diseases immediately after watching an episode of Dr. Oz. But this is real, daily-life disturbing stuff my friend is dealing with and it’s painful to watch. No amount of test results and assurance from physician after physician is able to convince him that he’s perfectly healthy. Every single thing that happens in his body sends him off to a specialist for more tests, more hunting to find the inevitable doomsday diagnosis. And it seems completely out of the blue to me. I am definitely finished poking fun at folks and using that word lightly. This is serious and is ruining my friend’s quality of life. And then, a recent murder/suicide attempt (the murder was completed) that is in the news involves people I know and dear friends of people I love. I don’t know what to do with it. What happens that drives someone to just snap one day and decide to take out a loved one (or two , or five) and then take one’s own life? What’s that process? It has to be more than depression because there are plenty of depressed people – plenty! What drives someone over the edge? Where is the edge? My boss recently accused me of having a “strong constitution” in the face of some challenges she has learned about my path the last few years and some particular struggles this summer. Do I? Is that it? Some folks have “a strong constitution” and some don’t? You might wonder why this worries me so much – if I’m sane, then relax. Why fret? Well, I worry and wonder because, in my view of the universe and such, I don’t see myself as all that different from any other human being. I am capable of the same things any other human is capable of, for better or for worse. There, but for grace, go I.
I worry because I don’t want to snap one day. I can definitely remember a point, during the worst of the worst in my marriage, that I asked Ex to get rid of the gun. I’m sure he thought (and told people) that I was suicidal or something but the truth was that I was experiencing rage and hatred for him like I had never felt in my life and quite honestly, I was afraid of what I was capable of. The gun was gone the next day, I’m sure. I don’t know exactly because I never opened the drawer where it used to be again. So many ways this post could go if I were writing to pontificate about whether I believe in grace or, if I do,what that means for me. Or, if I wanted to talk about gun control and whether I think that has any bearing on the rash of murder/suicides recently. But this isn’t a political or philosophical post. It’s just a girl worried about a friend and worried about friends who I know are wondering if there’s anything they could have done to have prevented this tragedy. I don’t know that I expected to come to any conclusions by the end of this — but it has, at least, helped me to clarify my questions. Be well and folks, please, take care of yourselves. I mean that with everything in me. Strong constitution or not, I am committed to self-care. I believe in the power of love to heal mind, body and spirit. I believe that all can be healed when we are courageous enough to look our realities square in the face, name what needs to be named, feel the pain fully and completely, express it however it comes out and regard and embrace all that is felt as part of our humanity. Some people heal in therapy, others in walks along the shore, others in reiki treatments, through writing, or drawing, or dancing, or ritual, or prayer. We all must find our own way. But find it. Hurt people hurt people. Heal yourself. Last night I decided to create a mediation space in my apartment. I pushed my couches closer together and made room between my sunny yellow couch and my patio door. 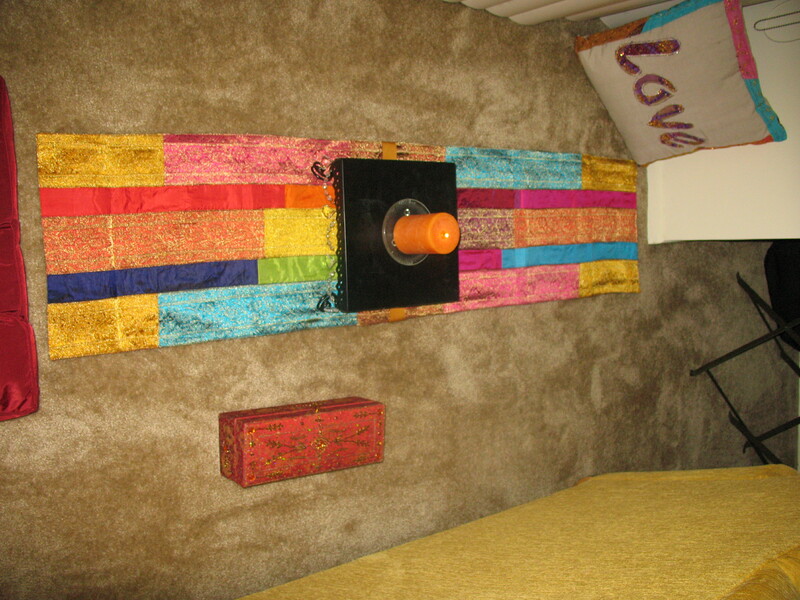 I bought a meditation pillow, a beautiful sari –style table runner, a little stand for my candle and a beautifully ornate box for other things I might need in that space. It is altogether lovely. Creating this space was precipitated by me placing Post-It notes all over the apartment the day before that say, “Have you been still today?” Yes, it’s that bad. I really have to force myself to stop doing all the time and practice just being. And, in the meantime, I’ve devised my master plan. I am going to move to Dallas and get a cheap 2 bedroom apartment (one for my bed, the other will be my yoga/meditation room), get a stress free job to keep me fed, while I write the national bestseller that I know is in me (somewhere), study integrative nutrition, philosophy, yoga and massage. Once the bestseller is fully realized I will travel the world discussing its themes and, back home, open a wellness center. This will be my life – helping others heal and become their best, enlightened, conscious selves. This is my ideal life – doing what I can to restore balance to the world, one soul at a time – beginning with my own.